Generally TPC-C benchmark workload is considered as one of the #1 references for Database OLTP Performance. On the same time, for MySQL users it's often not something which is seen as "the most compelling" for performance evaluations.. -- well, when you're still fighting to scale with your own very simple queries, any good result on something more complex may only look as "fake" ;-)) So, since a long time Sysbench workloads remained (and will remain) as the main #1 "entry ticket" for MySQL evaluation -- the most simple to install, to use, and to point on some sensible issues (if any). Specially that since new Sysbench version 1.0 a lot of improvements were made in Sysbench code itself, it really scales now, has the lowest ever overhead, and also allowing you to add your own test scenario via extended LUA scripts (and again, with lowest ever overhead) -- so, anyone can easily add whatever kind of different test scenarios and share with others ! (while I'd say "the most compelling test workload" for any given user should be the workload which is the most closely reproducing his production load -- and you can probably do it now with new Sysbench, just try it !). it also goes more far than original TPC-C test -- it's allowing you to run several TPC-C data sets in parallel (I was doing the same in the past by running several TPCC-mysql or DBT-2 processes on the same time -- which is allowing you to see "what is the next problem") -- but now you have the same out-of-the-box! From the past testings I've already observed that the most "representative" data set size for TPCC workload is around 1000W (1K "warehouses") -- it's not too small, nor too big to take a long time to generate the data + allocate too much disk space (generally it's using around 100GB in InnoDB once loaded).. -- probably over a time I will also test a x10 times bigger volume (or more), but for the moment the 1000W volume is already big enough to investigate MySQL scalability limits on this workload..
HW and my.conf are used the same as in the previous article about 8.0 OLTP_RW performance. as you can see, there is no much difference between 1S and 2S results..
interesting that MySQL 8.0 is still winning here anyway ! (and we may expect even better TPS once the index lock contention is lowered, but this is probably not a simple fix)..
the same 1000W workload, but with BP=32GB, so more IO-bound activity is expected..
however, TPS results between BP=128GB and BP=32GB configs are not that much different, right ? again, no idea about MariaDB..
initially I supposed this is due more indexes used in Sysbench-TPCC schema, but removing them did not help..
in fact, everything is looking similar, but there is still something which is making Sysbench-TPCC to have a different processing "signature" which is resulting in this intensive index lock contention..
and you can see here that peak TPS on 2S is more than 50% higher ! and the presence of lock_sys contention is blocking us from going more far..
Ok, and now -- how MySQL 8.0 compares to other versions ? 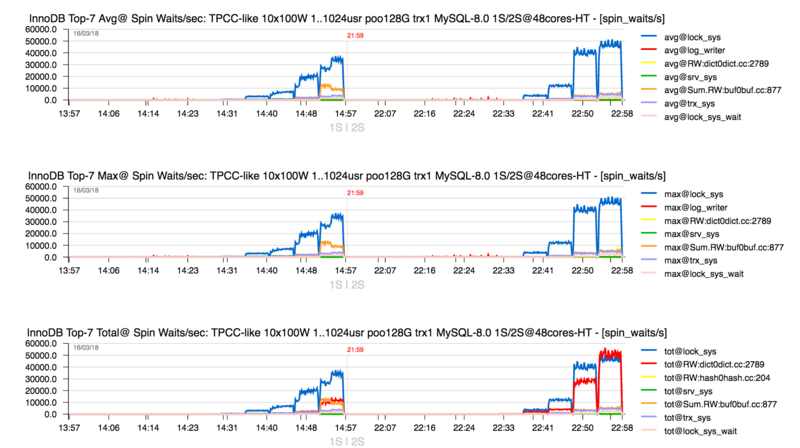 MySQL 8.0 is still showing the best TPS result on this workload as well ! NOTE : I could "hide" this TPS decrease by limiting thread concurrency, but I did not do it here intentionally to see all the other locks impact..
MySQL 8.0 is still do better than others here too ! again, TPS is not that much different comparing to BP=128GB config, so the workload is not that much IO-bound as anyone could expect.. -- definitively not something to use as a test case if your target is Storage Performance evaluation..
And I was ready to finish my post here, while Percona published their benchmark results comparing InnoDB -vs- MyRocks on Sysbench-TPCC 10x100W workload ! -- I was happy to see that MyRocks is progressing and doing well, but my main attention was attracted by InnoDB results.. -- as you can see from all the results I've presented above, there is not too much difference when we're going from 128GB BP config to 32GB BP config.. While from Percona results we're seeing exactly opposite.. -- not far from x3 times lower TPS between 128GB and 32GB BP configs ! -- how ever such is possible then ?.. First of all, in Percona tests was used 2S 28cores-HT server, so I'll limit my HW setup to 1S and use 24cores-HT only (for sure, it's not the same CPU chips, but at least the number of really concurrent tasks executed in parallel will be similar)..
and lower values for : io capacity / io max / lru depth / BP instances / cleaner threads / etc.. So, first of all I wanted to re-check the "base line" results with BP=128GB. the test #2 is the same as #1, but doublewrite=ON and AHI=ON, and you can see a significant TPS drop.. NOTE : while using so low IO capacities settings is not resulting here in TPS drops, it's lowering the resistance of MySQL Server instance to activity bursts -- Checkpoint Age is hitting its max limit, and sync flushing waits are already present during the test (aka "furious flushing").. -- so, I'd not suggest it as the right tuning. I don't test the impact of checksums here as it'll be simply not present in this workload (all data are in BP, checksums will be involved only on page writes which is going in background, so zero impact on overall processing)..
the first test is, again, with my initial config settings, and TPS is not too much lower than with BP=128GB..
the test #2 is as test #1, but with doublewrite=ON and AHI=ON, and indeed, not far from x2 TPS drop..
let's switch AHI=OFF now as in the previous case..
now, what is the impact of checksums ? and the test #5 is mostly reusing Percona config, except with AHI=off -- which is slightly lowering TPS..
and the impact is NOT because we're writing the data twice.. -- but because there is a lock contention in doblewrite code ! -- historically doblewrite was implemented as a small write zone, and as soon as you have many writes going in parallel -- you have a locking fight..
then, why doublewrite is more impacting in 32GB BP config comparing to 128GB BP ? other point : you should also keep in mind to look on TPS results as on "one whole"
once the peak TPS is reached, your main worry then is only about how to not loose it with higher load..
also, as you can see, even with x4 times less RAM for BP (32GB -vs- 128GB) and doublewrite=ON and checksums=ON we're still NOT x3 times worse on TPS, but rather near the same result as with 128GB BP !! MySQL 8.0 is doing better than any other/older version here !